In military terms, a salient is a battlefield feature that projects into enemy territory. Therefore, the salient is surrounded by the enemy on three sides, making the troops occupying the salient vulnerable. The Ypres Salient was formed by British, French, Canadian and Belgian defensive efforts against German incursion during the 1914 "Race to the Sea", culminating in the Battle of the Yser and the First Battle of Ypres. These battles saved Ypres and the corner of Belgium around Veurne from German occupation, but also led to the beginning of trench warfare in the salient as both sides "dug in" around the line. The landscape around Ypres is mostly flat, with few rises or hills. 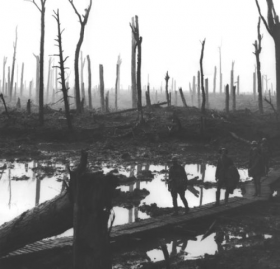 Those that did exist became the focus for the 1915 Second Battle of Ypres, which saw the first use of gas and the almost total destruction and evacuation of Ypres. During this battle, the Alliedunits were forced to draw back from Zonnebeke and St Julien to a line of trenches closer to Ypres. This line was to define the Ypres Salient for over two years, during which Hooge lay in one of the eastern-most sectors of the salient and became a site of intense and sustained fighting. This situation changed little despite extensive tunneling prior to the Battle of Messines in 1917 and the Third Battle of Ypres at Passchendaele in the same year. After the Third Battle of Ypres, the Ypres Salient was left relatively quiet until the Fourth Battle of Ypres, the Battle of the Lys, when the Spring Offensive threatened to overwhelm the entire area. This offensive was stopped at the point the Allies were closest to being forced to abandon the salient. By August 1918, the Fifth Battle of Ypres (part of the Hundred Days Offensive) pushed the German forces out of the salient entirely and they did not return.